In this practical guide, Prophet CEO Michael Dunn teams up with marketing effectiveness expert Chris Halsall to help marketing managers and CMOs make better marketing spending decisions and better evaluate the success or failure of these decisions. They show how to sort through the clutter of metrics, measurement, and analytic options, and provide the practical information needed to help establish the marketing accountability imperative--highlighting the critical need for more effective stewardship of marketing spending. Michael Dunn is CEO and chairman of Prophet and is responsible for overseeing the firm's strategy, client relationships, and people. He is the co-author (with Scott Davis) of Building the Brand-Driven Business from Jossey-Bass. Chris Halsall, former Prophet and McKinsey consultant, works and lives in New York City. PART ONE: UNTYING THE GORDIAN KNOT OF MARKETING INVESTMENT EXCELLENCE. 1. The Marketing Accountability Imperative: Understanding the Marketing Accountability Gap and Beginning the Journey to Close It. 2. Recalibrating Basic Beliefs About Marketing Spending: When Marketing Can Create Accretive Value and When It Is the Wrong Tool for the Wrong Problem. 3. 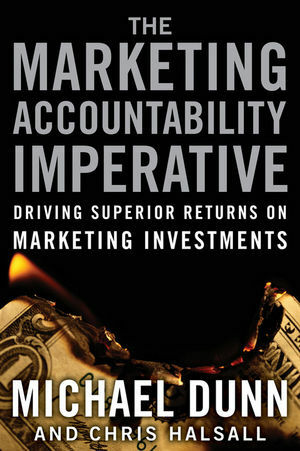 The Core Principles of Marketing Accountability: Describing the Critical Competencies and Value Levers That Enable Accountable Marketing Investment. PART TWO: DRIVING MATERIAL PERFORMANCE IMPROVEMENTS ACROSS THE SIX VALUE LEVERS OF MARKETING ACCOUNTABILITY. 4. Strategy and Content: Enabling Purposeful Strategic Decision Making and Creating Engaging, Compelling Content. 5. Marketing Vehicles and Investment Levels: Selecting Which Marketing Vehicles to Deploy and How Much Investment Gets Put Behind Each. 6. In-Market Execution and Fixed Cost Management: Ensuring High-Quality In-Market Execution and Consistently Strong Leverage from Your Fixed Cost Basis. PART THREE: PUTTING THE CORE PRINCIPLES OF MARKETING ACCOUNTABILITY TO WORK INSIDE YOUR ORGANIZATION. 7. Laying the Tactical Groundwork for Long-Term Marketing Improvement: Planning for Your Journey Through the Three Horizons of Marketing Accountability. 8. Horizon One: Identifying Your Marketing Accountability Improvement Opportunities: Designing a Fit-for-Purpose Marketing Accountability Diagnostic. 9. Horizon Two: Employing a Test-and-Learn Approach to Drive Continuous Improvement: Systematically Eliminating the Unknown and Improving Returns. 10. Horizon Three: Sustaining and Accelerating Marketing Accountability Impact: Building Sustainable Competitive Advantage via Deeper Capabilities, Faster Processes, and More Intelligent Brand Equity Development.